Unique and Intelligent Skin Rejuvenation System. 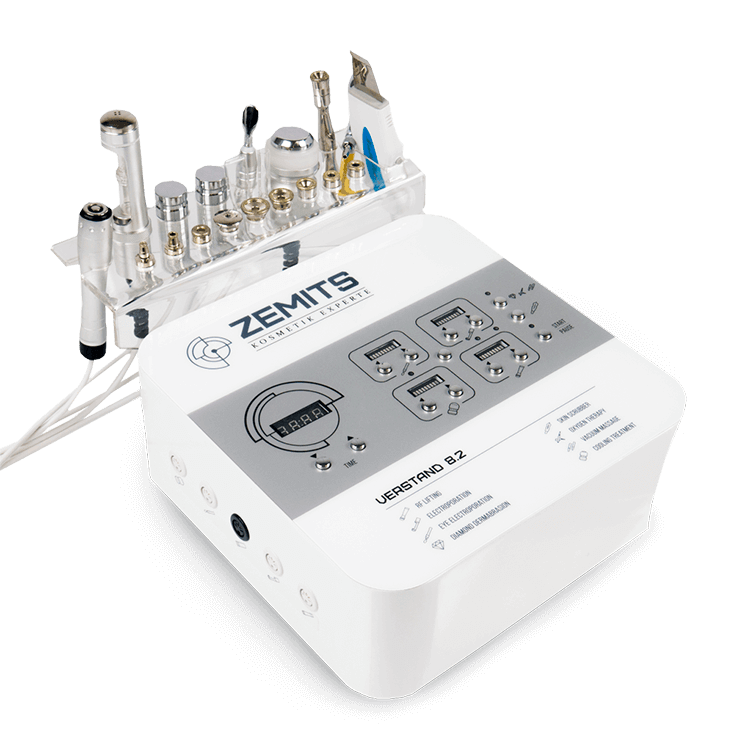 8 in 1 Facial Machine Zemits Verstand 8.2 is undoubtedly one of the best facial machines in the market, according to our customers and reviews. Radiofrequency therapy is a highly effective procedure. It works best against loose and sagging skin, lines, and wrinkles. Radiofrequency is pain-free and helps achieve rejuvenating results on the face. Electroporation, or Needle-Free Mesotherapy, is one of the most effective treatments against aging. It provides skin firming and face-sculpting; this creates younger, contoured look. 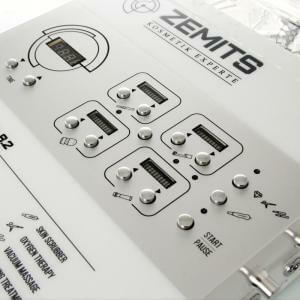 The Eye-Lifting modality on the Zemits Verstand is a method of replenishing cells and promoting healthier skin around the eyes. This is done by inserting vitamins and nutrients into the cells using ultrasound waves. 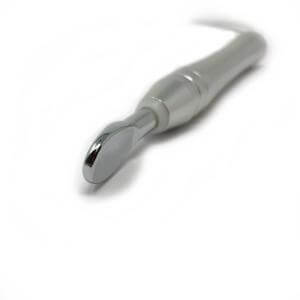 Diamond Microdermabrasion is a treatment in esthetic cosmetology to remove dead skin cells with a solid, stainless steel dermabrasion wand. This helps remove damaged skin layers, improve dull skin color, minimize and clean wide pores, and stimulate collagen production. Oxygen infusion - helps oxygenate and speed up the metabolism of skin cells. From this procedure, the skin acquires the ability to produce more collagen. As a result, patients have more taut, elastic skin without visible signs of aging. Cold therapy soothes irritation, reduces redness, and speeds up regeneration of the skin. It also stimulates the rejuvenation of skin cells. This step is the perfect finish to any abrasive treatment. Vacuum Extraction is a method to get rid of large blackheads and sebum throughout the face. This process is painless and quick, yet offers the incredible result of skin cleared of all dirt and oils. Skin Scrubbing is a renowned, painless method of microdermabrasion and referred to as "soft peeling". A spatula works to infiltrate nutritional solutions into the skin while subsequently ridding the skin of harmful debris and oils. All modalities into one beautiful, advanced machine. Bipolar Radiofrequency (RF) energy is a modern technology used for non-surgical skin tightening on early signs of loose or sagging skin. 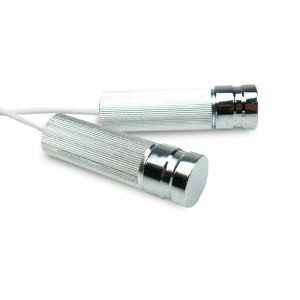 It is an electrical current technology with a frequency range of 0.1 to 5 MHz. Pure RF energy alone is primarily used to treat skin laxity through facial tightening, and it is best suited for patients with mild to moderate facial tissue sagging. By applying RF energy, which conducts current to mimic electrical circuits to the skin, any resistance encountered by the energy flow will produce heat at the site of maximum resistance. Via this treatment, radio waves penetrate the patient’s outer skin layers, delivering heat energy to the deep dermal layers. This energy stimulates collagen production and that, in turn, triggers tissue contraction. The overall result is tighter, brighter skin, and a significant reduction in sags and wrinkles. 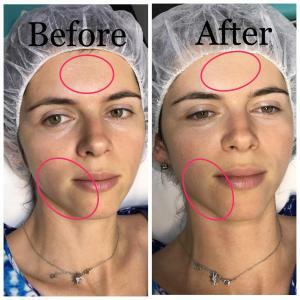 What are the Benefits of Radiofrequency Lifting? By applying RF energy to the human body, which can conduct current and therefore act as part of the electrical circuit, any resistance encountered by the energy flow will cause heat to be produced at the site of maximum resistance, which can also be used to cut or coagulate tissues. RF energy, when used for skin tightening, is able to penetrate deep into the skin and affect the deeper dermis and subcutaneous layers. This causes tightening and other improvements to the underlying tissue structure. Electroporation is significantly based on mesotherapy. 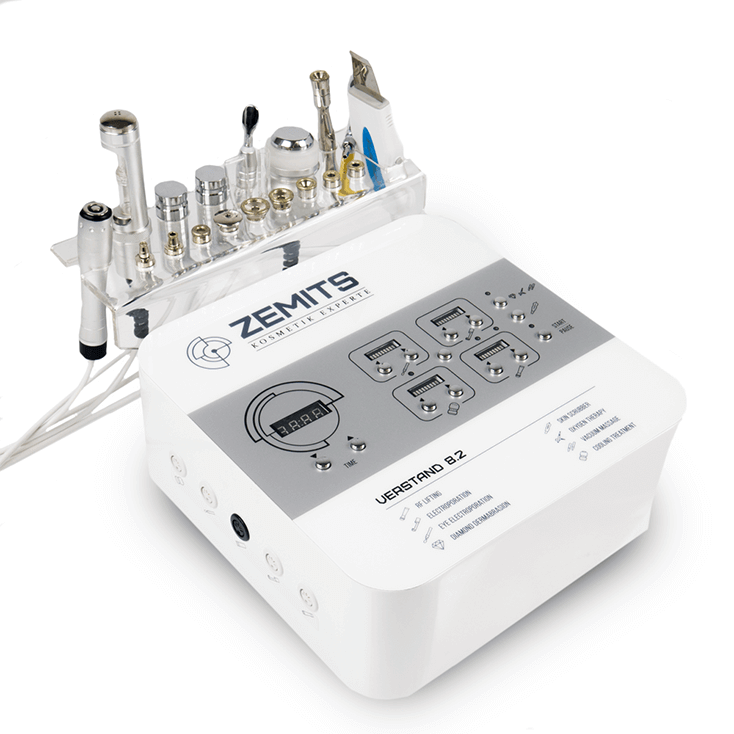 The electroporation in this technology specifically is used in biomedical science and accredited as an immensely useful technology in aesthetic cosmetics. 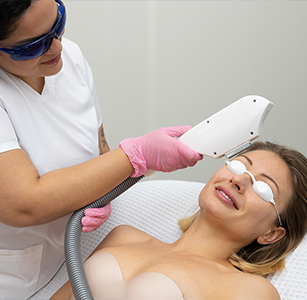 Our machine allows the skin to absorb even more active substances against the skin’s nature of low-permeability, and elimination of flaws by electroporation is done by directly fixing the roots of problems. 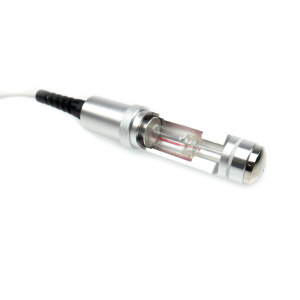 What are the Benefits of Electroporation? 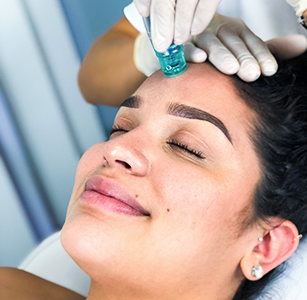 During needle-free mesotherapy, a water-based serum or gel with nutrients is applied topically to the area of skin to be treated and the handpiece is simply massaged over the product to increase absorbency and nutrient intake in skin. 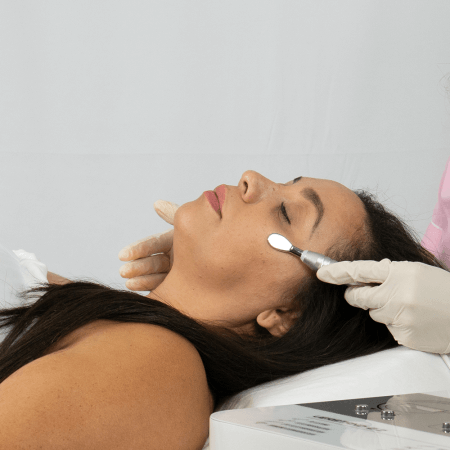 Electroporation then eases microscopic injections into the middle layer of the skin, with the frequency set at a level where the vitamins, minerals, amino acids, and medicines will travel the perfect depth into the skin for the best results. This process can combat free radicals, stimulate cellular processes, better circulation, improve lymphatic drainage, and encourage collagen and elastin production. Vitamin C and Hyaluronic acid especially improves skin radiance and glow in this process. 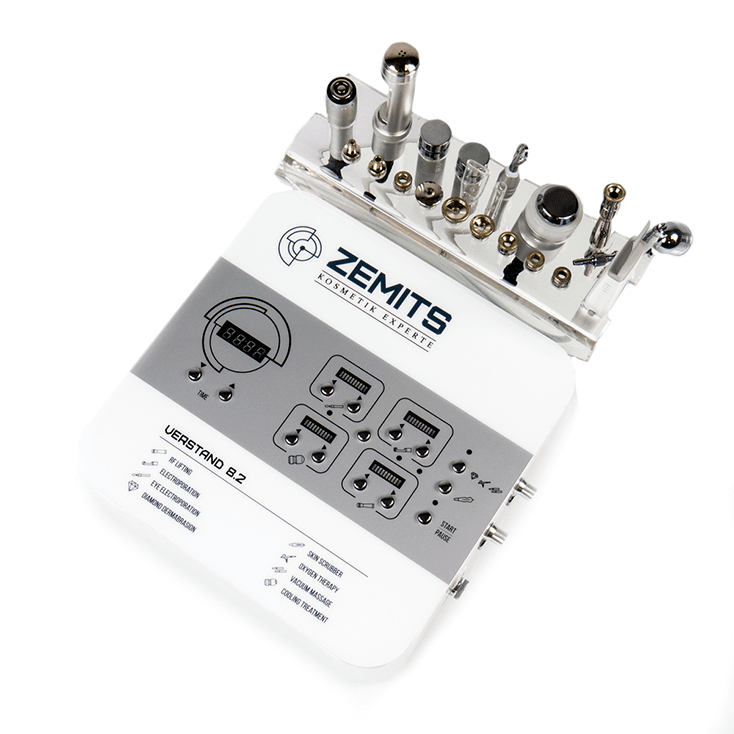 Zemits Verstand 8.2 has the unique Eye Lifting Tip- a flat spoon-shape handpiece, designed for sensitive around eye area. 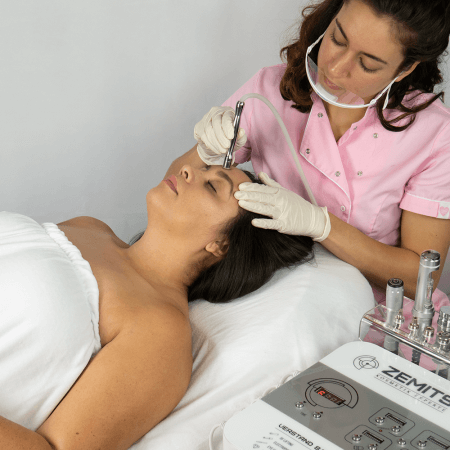 Eye Lifting modality on Zemits Verstand is a method of replenishing cells and promoting healthier skin around the eyes through inserting vitamins and nutrients into cells using ultrasound waves. 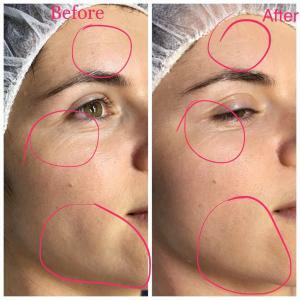 This procedure is painless and non-invasive, yet works just as effectively as mesotherapy with a needle does- without any of the side effects. In addition to nourishing cells, our unique handpiece massages the skin at the same time, further stimulating blood flow and increasing the effectiveness of mesotherapy. A water-based serum or gel with nutrients is applied topically to the area of skin to be treated and the handpiece is simply massaged over the product to increase absorbency and nutrient intake in the skin. 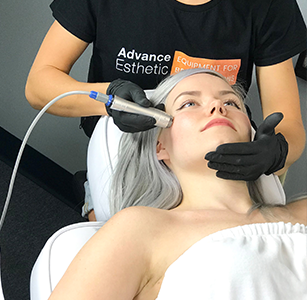 Electroporation then eases microscopic injections into the middle layer of the skin, with the frequency set at a level where the vitamins, minerals, amino acids, and medicines will travel the perfect depth into the skin for the best results. This process can combat free radicals, stimulate cellular processes, better circulation, improve lymphatic drainage, and encourage collagen and elastin production. Vitamin C and Hyaluronic acid especially improves skin radiance and glow in this process. Microdermabrasion is used to improve the superficial skin layer by wearing away the damaged epidermis. Thus, dead skin cells are eliminated and collagen production is stimulated. This step is very important because it works very closely and effectively with the oxygen treatment that follows it. 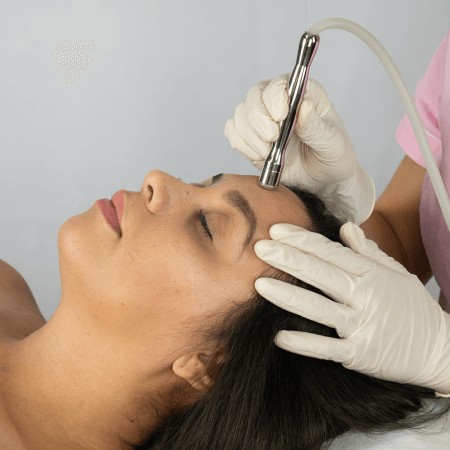 What are the Benefits of Diamond Microdermabrasion? The muscles in our faces and necks are responsible for creating facial expressions. As we get older, the expressions that we use on a daily basis produce lines on the skin as evidence of aging. Microdermabrasion removes the dead skin cells from the epidermis, improving the appearance of these fine lines and wrinkles. Diamond microdermabrasion uses tipped wands of various size and coarseness for different skin types and resurfacing depths. 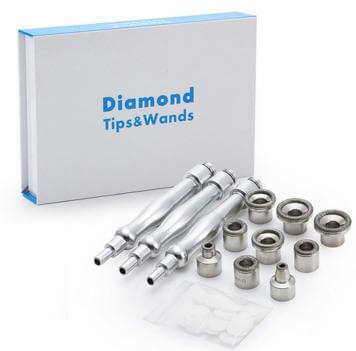 The wand tip is composed of natural diamond chips that smooth the skin and get rid of dead cells. These dead cells are then sucked up into a waste container through a vacuum. The natural diamond tips on this machine are simple to use and don’t cause any irritation to the skin. The epidermis is the outermost layer of the skin. It is composed of five layers. Each layer of the epidermis can be recognized by its shape and by the function of its cells. The main type of cell found in the epidermis is the keratinocyte, which produces the protein keratin. This is performed on dry skin, so no products are needed in addition to the handpiece. 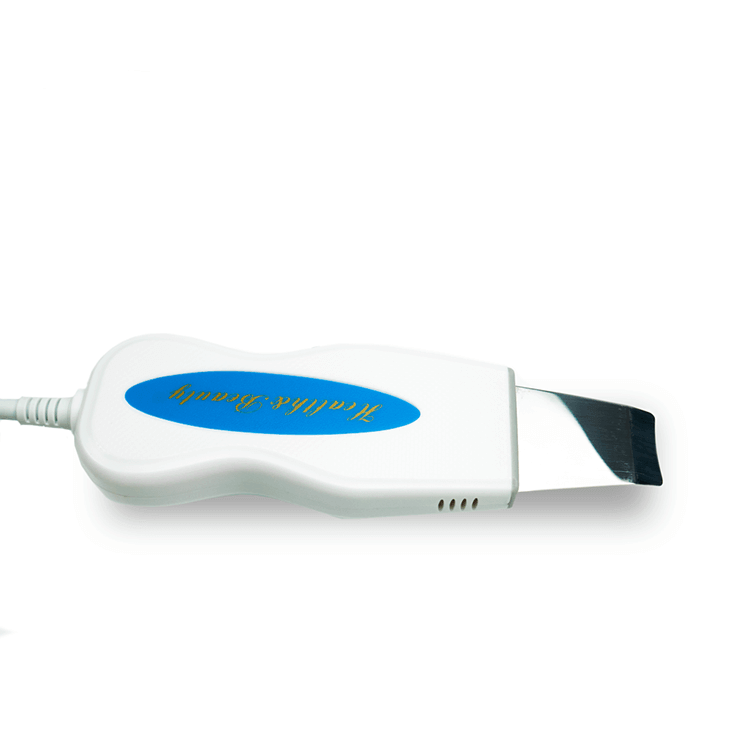 What is Ultrasonic Skin Scrubbing Spatula? The Ultrasonic Skin Scrubber enables procedures like facial cleansing. 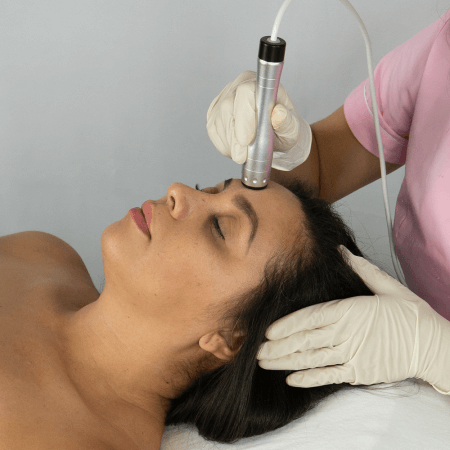 Methods of ultrasonic facial cleansing are based upon the cavitation effect and result in facilitation of the intensive rejection of dead cells, cleaning of oil glands ducts, and narrowing of enlarged pores. 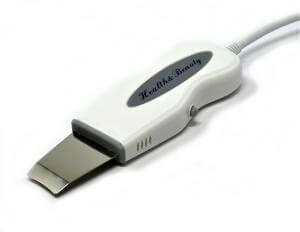 Ultrasonic vibrations work to remove dead skin cells as the spatula painlessly scrapes those cells off the skin. Subsequently, the solution used on the skin in preparation of the treatment is deeply infused beyond the surface of the skin to hydrate cells and create a healthier look and feel. 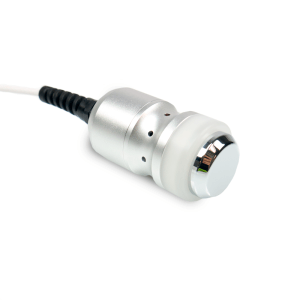 Low-frequency ultrasonic waves induce cavitation, or the creation and collapsing of bubbles in a liquid. The impact of micro-bubbles collapsing on the surface of the skin generate small jets that push out impurities and debris from the top layer of the skin. This also smooths out the stratum corneum, working by gently scrubbing off dead cells. Apply a toner,micellar water, or saline water to the skin directly before treatment begins. Oxygen Infusion has a strengthening effect on skin and cellular respiration. This treatment makes skin more resilient and glowing. The non-invasive treatment is painless and side-effect-free, and its antibacterial qualities reduce irritation in any region. Furthermore, it aids as a transport matrix for the infiltration of serum, allowing you to fully permeate any particular serum. An oxygen facial is a gentle, revitalizing treatment that uses air from the room, concentrates it through filters, mixes the oxygenated air with a solution, and creates a high force flow of low molecular liquid with oxygen. High-pressure volumes of oxygen penetrate molecules of serum deep into the skin and oxygen molecules stimulate skin rejuvenation. An oxygen concentrator uses air as raw material and a high-quality molecular sieve as an adsorbent, and adopts the principle of pressure swing adsorption (PSA) to directly separate oxygen from nitrogen at normal temperatures. Oxygen high in purity is thereby produced. The infusion of oxygen and vitamins into the skin encourages the production of collagen, which helps plump up facial features and restore volume and firmness to skin that has lost elasticity. Furthermore, an oxygen facial helps reverse the effects of environmental pollutants and rejuvenates oxygen-starved skin. Medical researchers believe that the infusion of oxygen into the skin may help the skin create new cells at a faster pace. This increased cell regeneration helps speed the healing of facial scars, acne, and blemishes. And Unlike other more invasive anti-aging treatments like microdermabrasion, oxygen facials don’t cause any uncomfortable side effects like stinging, burning or redness. The process of delivering the oxygen and serum is quite gentle, which makes oxygen facials suitable for individuals with sensitive skin and for those who would rather avoid injections or chemical treatments. First, we have the Vacuum Air Massage. Through this, lymph activation prevents sagging and eliminates toxins and tissue waste. Since this increases blood circulation, cell metabolism in cells is also sped up and the production of collagen and connective tissue improve. Lymphatic System: Simulates the pumping effect that the muscles normally create in the lymph vessels. By alternately applying and releasing pressure over the lymph vessels, lymph fluid is moved towards the nearest lymph nodes. Lymphatic circulation is increased which assists with the removal of waste products, and the appearance of any puffiness such as water retention will improve as a result. Circulatory System: Circulation is increased which brings fresh oxygen and nutrients to the area. Extreme dilation of the blood vessels results in erythema, which this process helps combat by reducing capillary congestion. Venous flow is also sped up, assisting in the prevention of couperose skin and rosacea. Muscular System: Increased circulation brings fresh oxygen and nutrients to the muscles and removes waste products, thus improving muscle functions. Cold therapy is the perfect finish to any abrasive treatment. It soothes irritated skin, reduces redness, speeds up regeneration, and triggers the rejuvenation of skin cells. What are the Benefits of Cold Therapy? Cold Therapy uses a Cold "Hammer" or flat surfaced handpiece to cool down the face and reduce redness and inflammation. This is a natural result of the characteristics of coolness when met with human skin. Cold temperatures constrict the blood vessels in the face so that less blood goes to the surface of the skin, reducing inflammation and swelling. The body then reacts by slowly increasing the amount of warm blood that goes to the face. It also works to tighten and clean enlarged pores by helping to unclog pores that make pores seem larger than they truly are. As debris and excess sebum are removed, pores are healthier and visually show it. This process tones the face and smooths the skin. 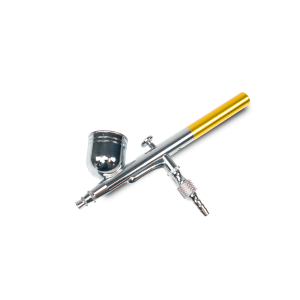 No products beyond the cold hammer handpiece are necessary for this treatment. 1. The Bipolar RF handpiece has a flat surface and special safety round electrodes. It is ideal for treating wrinkles around the eyes, lips, and jawlines. 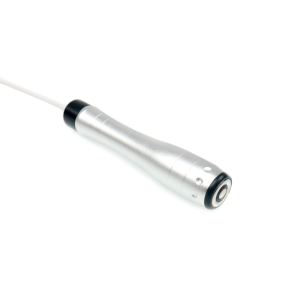 The structure of the bipolar RF handpiece allows for partial contact with the skin instead of full. The size of the handpiece is 4.5" length and the diameter of the active surface is 1". 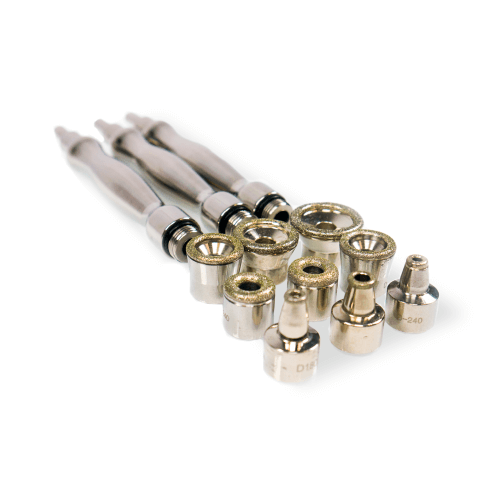 It makes this handpiece very safe and convenient for areas that are hard to reach. 2. The Needle-Free Mesotherapy handpiece has the convenient flat surface with holes for the serums flow and the internal replaceable bottle (3 bottles in a set) for different types of treatment. 3. 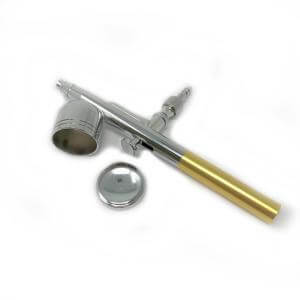 The Mesotherapy Eye Lifting handpiece is designed to provide safe, effective treatments for sensitive and hard to reach areas like those around the eyes, lips, and nose. 4. 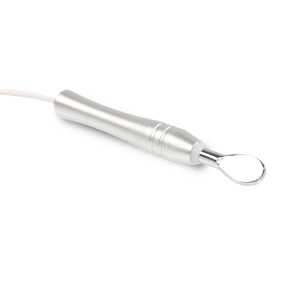 The Couple of Grounding Wands are used during Mesotherapy to control the currents and make sure treatments are properly targeted and safe for patients. 5. 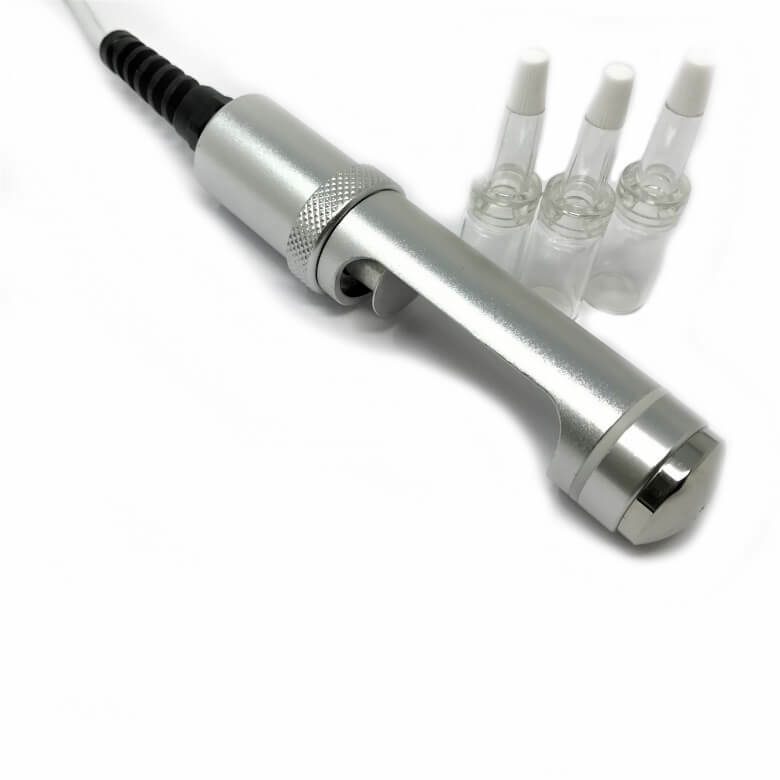 Oxygen Infusion Gun has a container for the serum to easily spread on and infuse into the deep skin layers. 6. The Skin Scrubber Spatula has a flat and safe spatula. 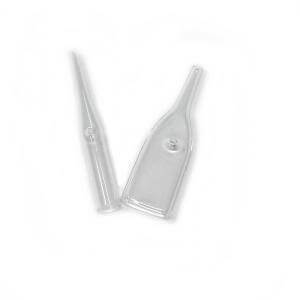 The shape of the handle is designed for comfortable using during treatment. It also has a control button on the side for easy start and pause of the procedure. The frequency of ultrasound waves can be adjusted on the side panel of the machine. 7. 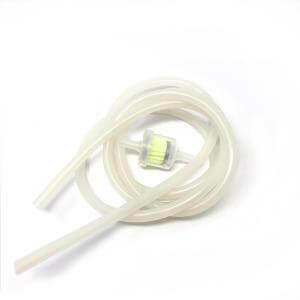 The Cold Therapy handpiece has flat 1" diameter. Use this to soothe skin after any kind of treatment. 8. Vacuum extraction and massage tubes are different shapes: round and flat one. It has the small hole on a side to control the vacuum pressure during treatment. Step 1: Cleanse the skin thoroughly and provide vacuum peeling treatment. Recommended treatment time is about 10-15 minutes at medium intensity. Step 2: Apply conductive gel and provide Radiofrequency treatment. Recommended treatment time is about 20-35 minutes at medium to high intensity. Step 3: Apply a serum (Vitamins complex/ hyaluronic acid/ peptides) and provide noninvasive Mesotherapy to moisturize and soothe the skin. Step 4: Provide Cold Therapy with a cold hammer or apply a cooling collagen mask if needed. Step 5: Provide oxygen infusion using serums with vitamin complex/hyaluronic acid/etc. Step 6: Apply SPF cream. Step 1: Apply a mask to expand the pores before treatment. Step 2: Provide deep ultrasound skin peeling. Recommended treatment time is 10-15 minutes at medium intensity. Step 3: Apply an anti-inflammatory serum (Vitamins complex) and provide non-invasive Mesotherapy electroporation treatment. Recommended treatment time is about 20-25 minutes at medium intensity. Step 7: Apply SPF cream. Step 3: Apply a whitening serum (that contains natural lightening ingredients) and provide noninvasive Mesotherapy to calm and soothe the skin. Step 4: Provide Oxygen Infusion using serums with whitening complexes. Step 5: Provide cold therapy by the cold hammer or apply a whitening mask if necessary. 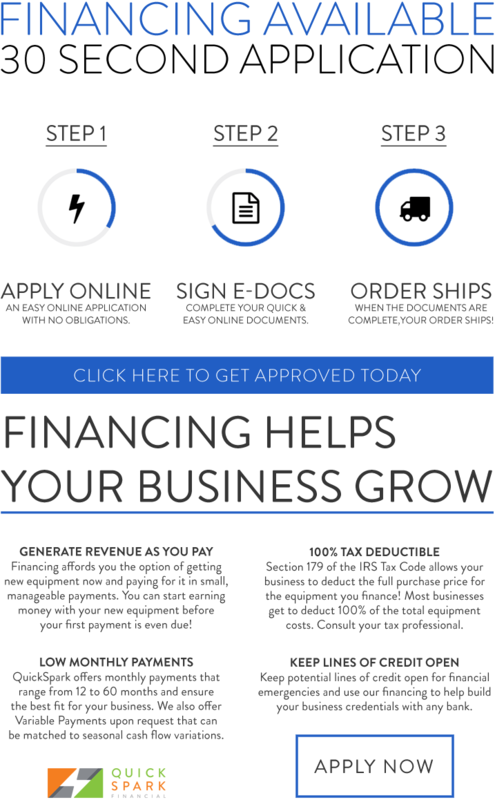 Each treatment (only one function) is around $100. 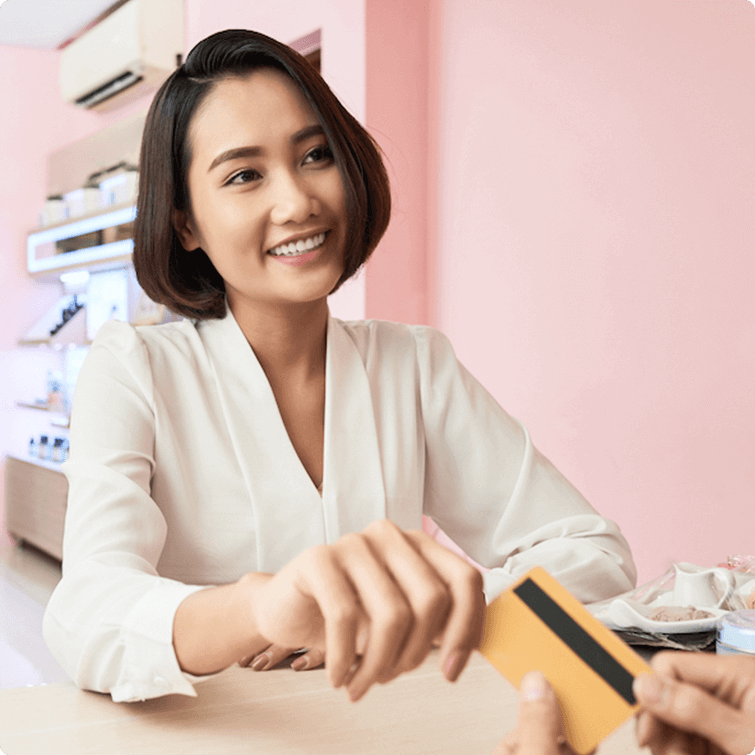 If patients request a treatment protocol with several functions, the price can be between $200 to $400 depending on the kinds of treatments included. 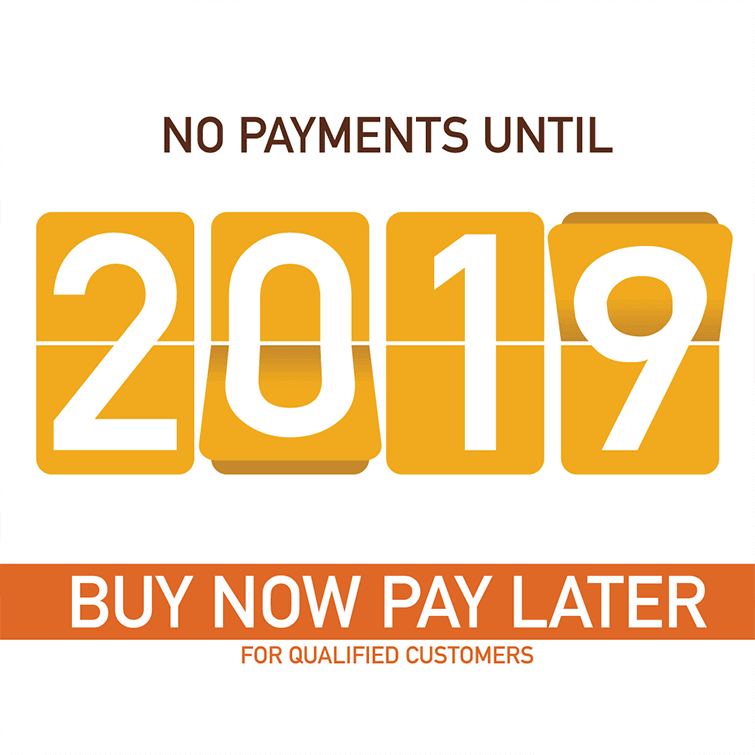 2 Year-Warranty and Lifetime Client Support.